Surely Anthony Geraci was born to play the blues, and to improvise so wickedly that he masters any style of blues. When he was four-years-old, Geraci told his parents he needed a piano; they bought him an old upright, but he soon was pounding it out on a baby grand. At the same time he was taking lessons at the Neighborhood School of Music in his hometown of New Haven, Connecticut, he was skittering over the ivories, improvising and following his own sharp musical instincts. Although his formal musical education came in the studios of Boston’s Berklee College of Music, his real schooling came when he and his friend, guitarist Ed Cherry, listened after school to blues records of artists such as Muddy Waters, Buddy Guy, and Jimmy Rogers. Over the years, Geraci has recorded with Muddy Waters, Big Joe Turner, Otis Rush, Big Mama Thorton, Hubert Sumlin, and Jimmy Rogers, among others. A founding member of Ronnie Earl and the Broadcasters, he’s also a founding member of Sugar Ray and the Bluetones. 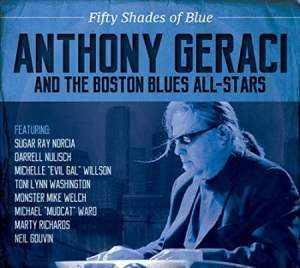 An all-star cast of musicians joins Geraci on Fifty Shades of Blue, including, among others, Norcia, who provides vocals and harmonica on six tracks, Monster Mike Welch on guitar, Michael “Mudcat” Ward on bass, Marty Richards on drums on all but two tracks, with Michelle “Evil Gal” Willson on vocals on two songs, and Toni Lynn Washington on vocals on one song. 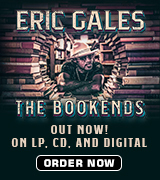 The album lives up to its title as the gathered faithful tear it up through country blues, pop-inflected blues, jazz, ragtime, and driving rock and pure gut-wrenching power blues. “Too Late for Coffee” kicks off with a spare piano roll that’s joined by Norcia’s vocal lament that it’s been too long since he’s seen his woman; since it’s “too late for coffee and too late for beer,” the singer declares, he wants to hold his lover tight since it’s been about a year. 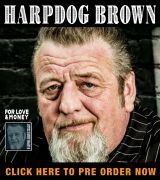 Jaunty and humorous, the song delivers a story of love-too-long-gone for which nothing will substitute; it’s a country waltz with a blues riff woven tightly into it. A pop-inflected, jazz standard, “Don’t Keep Me Waiting,” carries us back to the crooning tunes of the late ’50s and early ’60s, with Geraci providing a Vince Guaraldi-like piano cascade on the bridge. Languorous and wistful, the tune floats dreamily on the rolling waters of Geraci’s piano, punctuated by Richards’ brushes, and Norcia’s smoky vocals. On “Sad But True” Norcia moans straight up blues, with Welch’s slide guitar and Norcia’s own harmonica weaving under and around his vocals; it’s a mean old blues sandwiched between the playfulness of the title track and the New Orleans-inflected jazz blues of “Heard That Tutwiler Whistle Blow.” On the latter tune, Geraci’s rousing piano rolls and trills provide the foundation on which the straight ahead harp and vocals of Norcia play off. These songs, and these players, are all stars indeed. There’s not a track on this album that won’t take you out of yourself to moan, clap, cry, or laugh, and you’ll want a partner near you most of the time since Geraci and the All Stars deliver a soundtrack for the art and act of seduction. Reviewer Henry L. Carrigan, Jr. writes about music and music books for No Depression, American Songwriter, Country Standard Time, and Wide Open Country.